This post contains some affiliate links. This means that if you click on them and make a purchase, I might receive a small commission that goes back into helping me create more free recipes for you and generally keeping the blog going. Thank you for your support. This post was supported by Farmer's Choice. Now that's something that's not sitting in my fridge every week. This was a real treat, sent to me by the people at Farmer's Choice, the online butcher. And straight away I decided that I wanted to do something really special with it. I slow roasted it with wintery root vegetables and Bramley apples. The flavour is a bit like pork - but deeper, woodier - somehow more Medieval. And I know that sounds weird, but that deeply-flavoured, gnarly, burnished meat along with all those sweet, tender veggies made it feel like part of a Medieval feast. Without all the washing up. Or use of a fireplace. Seriously. 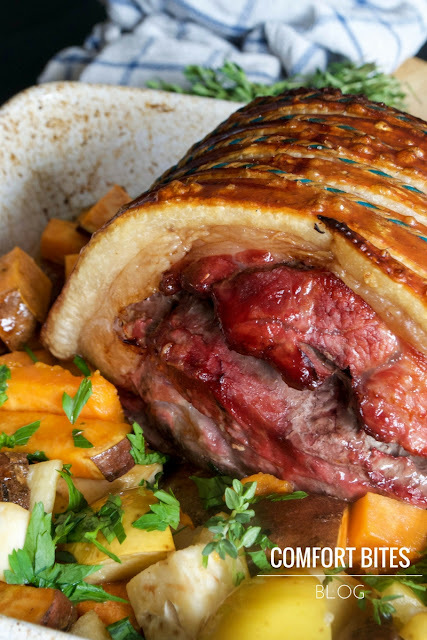 I know that wild boar isn't something you'd usually add to your weekly shop, but if you're after something extra comforting and full flavoured, treat yourself to this. One of our all-time favourite dishes. We love it. 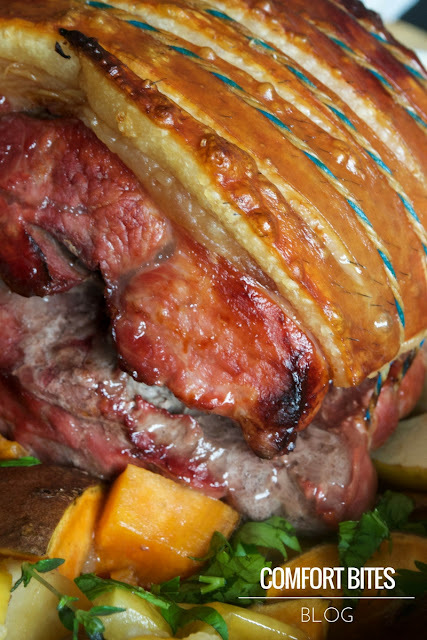 To make the slow roasted boar, set the oven on at gas mark 6/200ºC/400ºF and place the boar joint in a small roasting dish. Pat the skin dry and then rub olive oil (or you can use mild, unflavoured coconut oil if you prefer) onto it, and then sprinkle with a pinch of sea salt. Slide into the oven and roast for 25 minutes. After the 25 minutes are up, turn the heat down to gas mark 4/180ºC/350ºF and continue to cook for another 20 minutes. Once the 20 minutes are up, take the roasting tray out of the oven and rest on a board. Lift out the boar joint and then gently tumble the chopped vegetables and apples into the tray, being careful not to splatter any hot fat about. 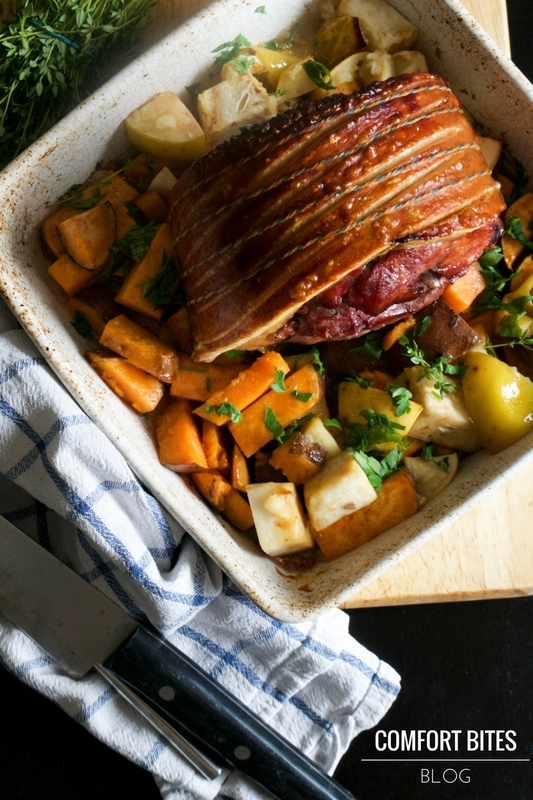 Using a spoon, coat the veggies in all the roasting juices and then place the boar joint on top. Strew with the fresh thyme. Slide back into the oven and cook for another 60-90 minutes. Check the boar is cooked thoroughly until no blood remains. Put it back in for a bit longer if you need to. The vegetables should be tender and soft. Scatter with the fresh parsley and then slice the boar joint, serving hot, with the vegetables and some of the roasting juices alongside. I received the wild boar and a contribution towards the ingredients for this recipe from Farmers Choice. I've been working with them for over a year now, and I've always found their meat, fish and game of fantastic quality. Do go check them out!